The EU is facing mounting pressure over its tackling of the migrant crisis in the Mediterranean, and is calling for an emergency summit, after hundreds drowned off the Libyan coast and pictures from a shipwreck, in which 4 drowned, emerged on Monday. European Council President Donald Tusk has called for an extraordinary summit of EU leaders on Thursday to discuss a joint response to the massive influx of migrants. "We need immediate action from the EU and the member states," she added. Human rights activists lashed out at the EU, accusing the bloc of failing to deal with the migrant crisis. The UN Refugee Agency expressed its “deep shock” at the latest tragedy. 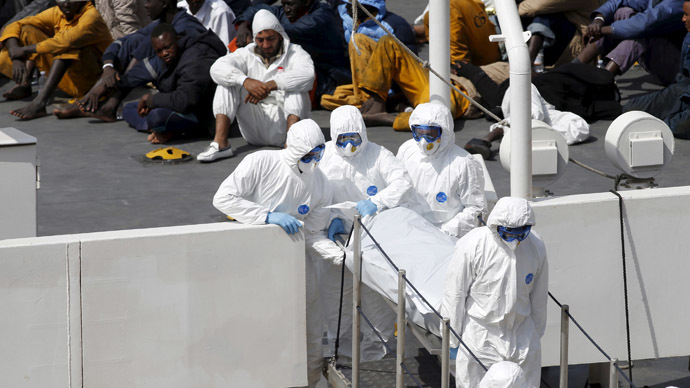 Spokesman for UNCHR (United Nations High Commissioner for Refugees), Carlotta Sami, described the disaster as “one of the most tragic shipwrecks in the Mediterranean,” and called for “shared responsibility” for the migrant situation of EU countries. Other human rights activists supported the cause, too. “In this affair, Europe is guilty of failing to assist a person in danger. That is to our shame,” the founder of the Medecins Sans Frontieres medics charity and ex-French foreign minister Bernard Kouchner told Le Parisien. "Before anything else, let's throw a lifeline to all these people who are drowning by creating a European rescue fleet for the 28 members of the European Union. One rescue boat for each country," he added. On Sunday, Pope Francis also appealed “to the international community to react decisively and quickly to see that such tragedies are not repeated." On Monday, an Italian patrol with 24 bodies recovered from the ocean arrived in Malta, while bodies are also reportedly washing up on the Libyan coast. The death toll, thought to be 900, represents the worst single disaster in a humanitarian crisis thriving in the aftermath of the western-backed Libyan ‘revolution’. A Bangladeshi survivor told Italian media there had been 950 passengers on the boat. Reuters is reporting the EU may send warships to Libya to stem the smuggler tide, citing a draft document that surfaced Monday. Libya, through which the majority of migrants pass, has seen lawlessness since the ouster of Muammar Gaddafi in 2011, with criminal gangs sending vessels to carry migrants from Africa and the Middle East. Gaddafi’s toppling was greatly assisted by EU and US support of opposition forces. Catherine Shakdam, the associate director of the Beirut Center for Middle East Studies, echoed concerns voiced by human rights activists, saying that “women and children, civilians, are dying,” and Europe should bear the brunt. "I can understand that migration has become a problem in Europe, but you are talking people's live here. Europe... has to take responsibility, because they have somehow created that chaos," she told RT.